Tonight's guests include Martha Stewart and Harland Williams. Kasey Chambers & Shane Nicholson perform. Tonight's guests include Diane Lane and Patton Oswalt. Little Feat perform. Tonight's guests include Eva Mendes and Luke Russert. The Fab Faux perform. 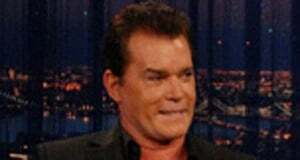 Tonight's guests include Ray Liotta and Marc Maron. Loudon Wainwright III performs. Tonight's guests include Anderson Cooper and Willie Nelson. Southside Johnny with La Bamba's Big Band perform. Tonight's guests include Ice-T and Dwayne Wade. Shane Mauss performs. Tonight's guests include Billy Bob Thornton and Aasif Mandvi. Kenny Shopsin performs. Tonight's guests include Jamie Pressly and Little Britain. Lenka Kripac performs. Tonight's guests include Julianne Moore and Zachary Levi. Jakob Dylan performs. Tonight's guests include Brooke Shields and Robert Reich. Amos Lee performs. Tonight's guests include Russell Crowe and Alicia Keys. Death Cab For Cutie perform. Tonight's guests include Molly Shannon, Jason Ritter and Noah McCullough. Tonight's guests include LL Cool J and Oliver Stone. Dead Confederates perform. Tonight's guests include Christian Slater and Brian Posehn. Flobots perform. Episode 31 - Harry Connick, Jr., Richard Lewis, O.A.R. Tonight's guests include Harry Connick Jr. and Richard Lewis. O.A.R. perform. Tonight's guests include Edward Norton and Chris "Ludacris" Bridges. Mike Birbiglia performs. Tonight's guests include Charles Barkley and Justin Long. The Annuals perform. Tonight's guests include Tina Fey and Peter Sarsgaard. The Black Crowes perform. Tonight's guests include Tracy Morgan and Paget Brewster. The Last Shadow Puppets perform. Tonight's guests include Mary-Kate Olsen, Will Forte and Tom Nardone. Tonight's guests include Dennis Hopper and Katt Williams. Phil Lesh & Friends perform. Tonight's guests include Elvis Costello and Madeleine Albright. Lordi perform. Tonight's guests include Seth Green and Artie Lange. Conor Oberst & The Mystic Valley Band perform. Tonight's guests include Tom Brokaw and Frank Caliendo. Joshua Radin performs. Tonight's guests include Paul Rudd and John Stamos. Boz Scaggs performs. 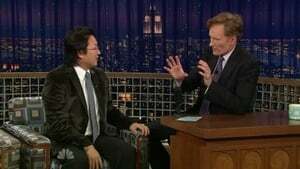 Tonight's guests include Masi Oka and Alan Zweibel. Rock of Ages perform. Tonight's guests include Snoop Dogg and Brian Regan. Blitzen Trapper perform. Tonight's guests include Jeff Corwin and Debra Messing. John Hodgman performs. Tonight's guests include Martin Short and Sarah Vowell. Margot & The Nuclear So and So's perform. Tonight's guests include Ethan Hawke and Nikki Reed. Plain White T's perform. With guests Hugh Laurie, Joel McHale, and The Gaslight Anthem. Tonight's guests include Amy Adams and Eddie Izzard. John Legend performs. Tonight's guests include Matthew Broderick and Paul F. Tompkins. Little Big Town perform. Tonight's guests include Jennifer Aniston and Judah Friedlander. Pilobolus perform. Tonight's guests include Carson Daly and Steve Schirripa. Bela Fleck and the Flecktones perform. Tonight's guests include Dustin Hoffman and Greg Giraldo. Greg Giraldo and the Old Crow Medicine Show perform. Tonight Conan welcomes Clive Owen, Judah Friedlander and musical guest Brett Dennen. Tonight Conan welcomes Norm MacDonald, Gordon Ramsay and musical guest Levon Helm. Tonight Conan welcomes Jimmy Fallon, Rose Byrne and musical guest John Pizzarelli. Tonight Conan welcomes Alec Baldwin, Eliza Dushku and musical guest They Might Be Giants. Tonight Conan welcomes Isla Fisher, The Jonas Brothers and musical guest Dan Auerbach. 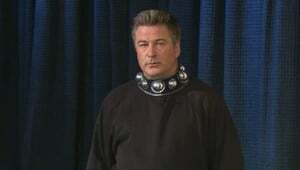 Tonight Conan welcomes Bob Saget and musical guest Thenewno2. Tonight Conan welcomes Jason Sudeikis. 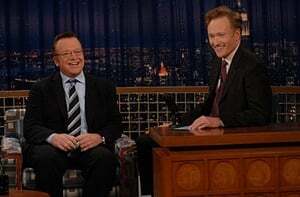 Tonight Conan welcomes Nathan Lane and Martha Stewart.